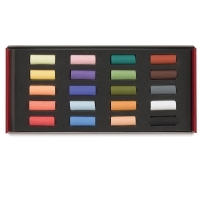 Created by combining the finest pigments with a minimal amount of binder, Artists’ Soft Pastels have a velvety texture that offers easy laydown and consistent coverage. 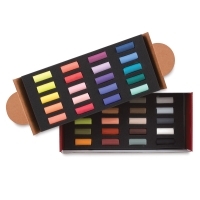 They’re great for blending, layering and softening edges — all with minimal crumbling. They’re also extremely lightfast. Individual sticks measure 2½" long × ½" diameter (64 mm × 13 mm). 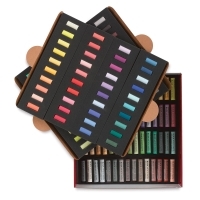 Blick Artists' Soft Pastels are now available in a variety of half stick sets, giving artists access to twice the colors and twice the creative possibilities of full stick sets. 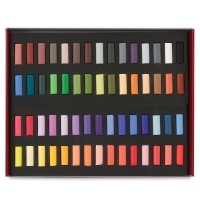 Choose sets of 20, 40, 60, or 120 half sticks. 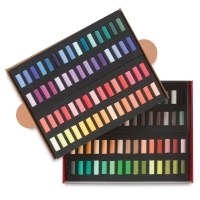 The set of 140 contains 60 full-size sticks and 80 half sticks. Half sticks measure 1¼"L × ½"Dia (32 mm × 13 mm). For professional quality at an affordable price, artists choose Blick Artists’ Soft Pastels. 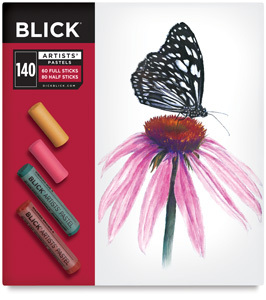 To view a PDF of the Blick Artists' Pastels, please click here.